· Kurt Busch won the 59th Annual Daytona 500 Monster Energy NASCAR Cup Series race at Daytona International Speedway Sunday afternoon. For Busch, it is his 29th victory in 577 Monster Energy Cup Series races. · It is Busch’s first victory and 17th top-10 finish in 32 races at Daytona International Speedway. · Ryan Blaney (second) posted his first top-10 finish in four races at Daytona International Speedway. It is his first top-10 finish in 2017. · A.J. Allmendinger (third) posted his third top-10 finish in 16 races at Daytona International Speedway. · This year, NASCAR introduced a new stage format in all three national series where each race is segmented into three stages. In addition to the points awarded at the end of a race (Final Stage), points are also awarded to the top-10 finishers of the first two stages (Stage 1 & Stage 2). · Kyle Busch won Stage 1 of the Daytona 500. · Kevin Harvick won Stage 2 of the Daytona 500. 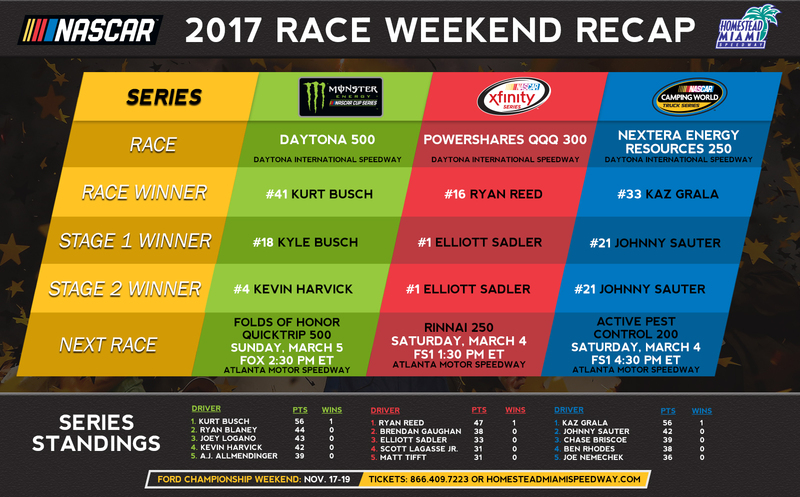 · Kurt Busch leads the point standings by 12 points over Ryan Blaney. · With the win, Kurt Busch becomes the first driver to qualify for the 2017 Monster Energy NASCAR Cup Series Playoffs. The Playoffs culminate with the Ford EcoBoost 400 championship finale on November 19 at Homestead-Miami Speedway. · In 16 career Monster Energy NASCAR Cup Series starts at Homestead-Miami Speedway, Kurt Busch has posted six top-10 finishes and four top 5s, including a victory in the 2002 Ford EcoBoost 400. Busch also celebrated his 2004 Monster Energy NASCAR Cup Series championship at Homestead-Miami Speedway. · Ryan Reed won the 36th Annual Powershares QQQ 300 NASCAR XFINITY Series race at Daytona International Speedway on Saturday afternoon. It is Reed’s second victory in 106 NASCAR XFINITY Series races. · It is Reed’s second victory and fourth top-10 finish in seven races at Daytona International Speedway. · Kasey Kahne (second) posted his 12th top-10 finish in seven races at Daytona International Speedway. It is his first top-10 finish in 2017. · Austin Dillon (third) posted his seventh top-10 finish in nine races at Daytona International Speedway. 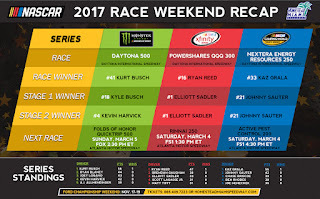 · Elliott Sadler won Stage 1 and Stage 2 of the Powershares QQQ 300. · Reed leads the point standings by 9 points over Brendan Gaughan. · With the win, Ryan Reed becomes the first driver to qualify for the 2017 NASCAR XFINITY Series Playoffs. The Playoffs culminate with the Ford EcoBoost 300 championship finale on November 18 at Homestead-Miami Speedway. · Kaz Grala won the 18th Annual NextEra Energy Resources 250 NASCAR Camping World Truck Series race at Daytona International Speedway on Friday night. It is his first victory in ten NASCAR Camping World Truck Series races. · It is Grala’s first victory and first top10 finish at Daytona International Speedway. · Austin Wayne Self (second) posted his first top-10 finish in two races at Daytona International Speedway. It is his first top-10 finish in 2017. · Chase Briscoe (third) posted his first top-10 finish at Daytona International Speedway in his first start. · Johnny Sauter won Stage 1 and Stage 2 of the NextEra Energy Resources 250. · Grala leads the point standings by 14 points over Johnny Sauter. · With the win, Kaz Grala becomes the first driver to qualify for the 2017 NASCAR Camping World Truck Series Playoffs. The Playoffs culminate with the Ford EcoBoost 200 championship finale on November 17 at Homestead-Miami Speedway.